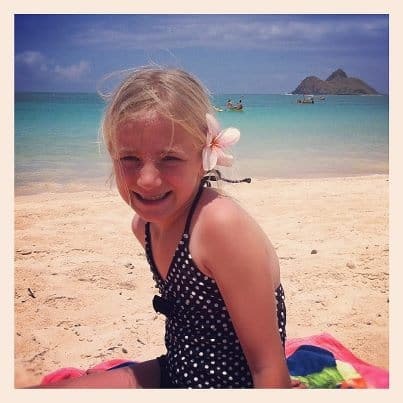 Waikiki, although often overcrowded, is an “easy” beach for my family. The stretch along Waikiki is actually multiple beaches, but for this purpose, I am referring to the area in front of the Hilton and Hale Koa Hotels. From sun up to sun down, we find the water to be swimmable, the sand is soft with small pebbles, and the people-watching is an activity in itself. There are nearby booths to rent everything from stand up paddle boards to water bikes that float on top of the water. We buy a cheap boogie board and the kids ride in the little waves. There is not much of an under tow and when the sun gets too hot, there are plenty of snow cone stands and restaurants nearby to help cool us down. A picturesque view of Diamond Head reminds locals and tourists alike that these waves were once ridden by Hawaiian royalty. A warning: when I was here last, a Navy carrier came to port nearby and 4000 people swarmed Waikiki, so this is not the beach to go to if you are looking for a reclusive spot. 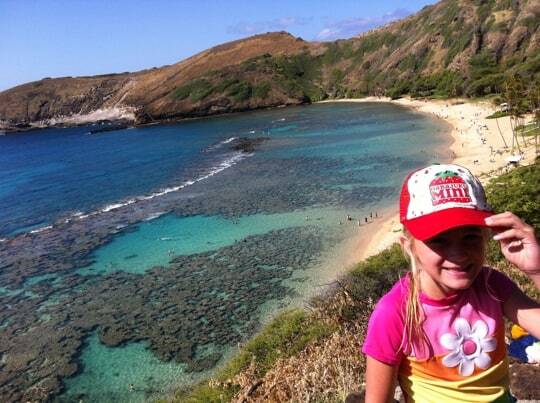 Hanauma Bay is an awesome place to snorkel that just so happens to have a beautiful, pristine beach wrapping around it. I was told numerous times to be at the gates by 6am to avoid the crowds. We arrived early and for a moment (maybe a half an hour) my daughter and I experienced the beach with the sun rising along with only a handful of people. It was enchanting! My daughter with her pink snorkel and I with my goggles floated over the reef and watched numerous fish pass by, saw perfectly shaped coral and even got to swim alongside a green turtle. In between snorkel sessions, we spread ourselves on the white soft sand and built castles which we decorated with nearby shells. There is a snack bar on the beach and clean bathroom with numerous showers; the beach has an entrance fee. The crowds came around 9a.m. and they came quickly. The entrance is shut after a certain amount of people arrive, so do go early. A steep walk down gets you to the beach, so if you’re nervous with the kids, take the shuttle for a small fee. (It also would be nice at the end of the day when the kiddos are tired.) This is a good place to teach children tangibly that we need to treat our ocean with respect. At the entrance, a video is available to watch and learn how to treat and protect the reef in the bay. A large clapboard identifies the fish in the bay, both by name and with pictures. After seeing the fish that day, we were able to find which ones we saw. Living near Southern California beaches that can often be covered in trash, I appreciated the work and dedication that is given to protecting the beauty of this beach. This is where President Obama goes to vacation. I think that pretty much says it. This beach is in a residential area, but park along the roads, find a beach access and you’ve found the white sands and turquoise waters of the Hawaii of your dreams. There is no convenience store nearby or bathrooms that I saw, so this is definitely a pack a picnic kind of stop. Found on the military R & R base of the same name, Bellows Beach is open to the public on the weekends and allows civilians to explore a beach that to me is straight out of the show Lost. Like Lanikai, the sand is white and the water crystal blue. The current is strong and I would recommend being a stronger swimmer if you plan on going farther out in the water. But this beach has a wonderful park that a mama can sit at, watch her kids play on the castle playground, and still see the ocean. There are plenty of parking spots and bathrooms. For breakfast or lunch I highly recommend the cute Waimanaolo Cafe that serves fresh, local foods and is located right outside of the base’s entrance. 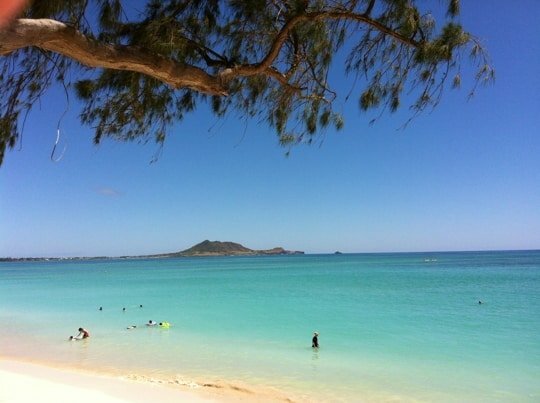 Kailua is my happy place; go soon if you want it to be yours too. What once was a hidden gem has now become a tourist destination. Where once I felt like a traveler rambling into a small corner of the world, I now feel like a commuter to a major destination. But you know what? I still love it and that’s why I’ve ranked it number one. Maybe its small town charm is turning a little metropolitan, but it’s still where I find myself going to escape Honolulu. It’s the lifestyle I want: swim, sun, sand, and water sports. Kayak rentals are available and one can launch out to small islands that call from the shore. Families congregate under pops-ups or tree groves and set up for the day. This is a beach where you come early and stay late because you just don’t want to be anywhere else. Even my husband who hates to swim found himself in the water splashing the kids and enjoying himself. During some months, man-o-wars float through, and my daughter did get stung, but the lifeguards were helpful and the next day she couldn’t stay away from this beloved beach. Do not leave ANY valuables in your car while at the beach. You may think you are being sneaky hiding something in the trunk near the spare, but it’s not worth it. Car theft is a huge problem and nothing ruins a vacation like losing money. Pack in, pack out. This one is obvious, but don’t litter. Hawaiians treasure their beaches so show respect by leaving it the way you found it. Haven’t been to Hawaii in 10 years. This makes to take the kids. 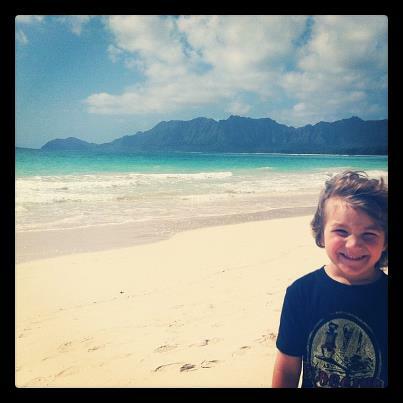 My favorite beach is Hanauma Bay. It’s amazing how close the fish are and how you can almost touch them.